I'm writing for two reasons. First, I just tried calling Customer Service a number of times, but I can never get through. I press "1" for customer service, then I hear a series of clicks and am subsequently disconnected. So there's that. Second, and more importantly, I had a shirt returned to me today with two dramatic, vertical gashes running down its front. The gashes are both at least six inches long. 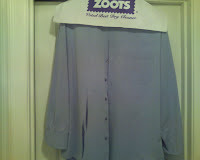 The shirt arrived with an incident number (668664) and a notice that your "garment resolution" officer (hardly an objective arbiter of the matter) had determined that these significant tears aren't Zoots' fault. I'm sorely troubled both by this process and its outcome. In fact, it seems like a bit of a "kangaroo court" to me. In support of this "tough luck" determination, Zoots attached a photocopied circular, the International Fabricare Institute's TABS Bulletin No. 331, which reads, in a nutshell, "whenever shirts tear, it's because they've been worn out by the wearer (except in the rare case when dry cleaning machinery tears them)." Aside from being a self-serving industry circular, this bit of "evidence" is itself equivocal and says nothing specific about the two horrific, parallel slashes in my dress shirt. Your Bulletin No. 331 states that "[s]ome garments will develop weak, thin, and frayed areas after a period of time that may not become objectionable until after the agitation of some professional care procedure." This worn fabric is characterized by its "rough, pilled, distorted, thin, or even torn" condition. None of those adjectives applied to my shirtfront, which was in pristine condition when I left it out for pickup. Nothing about my shirt predisposed it to be shredded in so dramatic a fashion. On the evidence before me, I have to reject Zoots' summary, unilateral "resolution" of this matter, and I would like to speak to a Customer Care Professional about this, if anyone should be handy over there to pick up the phone.